Be the first to share your favorite memory, photo or story of Luzenia. This memorial page is dedicated for family, friends and future generations to celebrate the life of their loved one. 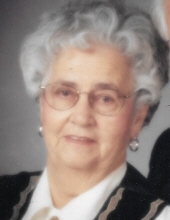 Salem/Loa, Utah - Our kind and loving mother, grandmother, great-grandmother and friend, Luzenia Mayhew Rees, age 95, passed away peacefully at the home of her daughter in Holden, Utah on April 12, 2019. She was born August 27, 1923 in Maben, West Virginia, a daughter of Charles Baker and Rebecca Mosley Mayhew. She graduated from Portsmouth High School, Class of 1941. Luzenia married the love of her life, Spencer T. Rees March 24, 1944 in the Manti LDS Temple. Together they raised six children in Loa, Utah. Spencer passed away December 3, 2009. Luzenia was an active member of the Church of Jesus Christ of Latter-day Saints. She served in the Primary and as Relief Society President and in many other callings. She worked as a Temple Ordinance Worker, and served a 6 month mission to the Northern States and 3 other missions with her husband, Spencer, to the Philippines, San Diego and Cove Fort. She was an avid indexer and has done over 230,000 names. She attended the Temple regularly until 2 months ago when her health started failing. She was a genuine ministering angel, who drew people to her where ever she went. She had a listening ear for everyone. Luzenia enjoyed reading, cooking for her family and feeding anyone that she could. She often said her greatest accomplishment was her 6 children. She was a wonderful mother and grandmother and will be greatly missed. She was looking forward to being with her sweetheart, her son and all of her family members who have preceded her in death. Luzenia is survived by her children: Stephen and Linda Rees of Salem, Stanley and Karen Rees of Sandy, Carolee and Craig Tatton of Centerville, Jolynn and Jim Blodgett of Holden, Sterling and Cynthia Rees of Salem, daughter-in-law: Claudia Rees of Midway, 27 grandchildren and 60 great-grandchildren. She is preceded in death by her parents; her husband, Spencer T. Rees; a son, Devon Rees; a grandson; and all of her siblings: Harry Mayhew, Charles Mayhew, Earl Mayhew, Park Mayhew, Ed Mayhew, Jim Mayhew, Carrie Stonebraker, Virginia Wiggins and Rebecca Keller. The family would like to extend a special thank you to the Millard County Hospice Team, for their kind and considerate care of our Mom in her last days. You are truly angels here on earth. Funeral services will be held on Saturday, April 20, 2019 at 1:00 P.M. in the Knoll Park LDS Ward Chapel, 160 South 400 West in Salem, where friends may call for viewing Saturday morning from 11:00 A.M. to 12:30 P.M. prior to the services. Graveside services and burial will be Monday, April 22, 2019 at 1:00 P.M. in the Loa Cemetery under the care of the Springer Turner Funeral Home of Richfield and Salina, Utah. To send flowers or a remembrance gift to the family of Luzenia M. Rees, please visit our Tribute Store. Guaranteed delivery before Luzenia's viewing begins. Guaranteed delivery before Luzenia's service begins. Guaranteed delivery before Luzenia's graveside begins. "Email Address" would like to share the life celebration of Luzenia M. Rees. Click on the "link" to go to share a favorite memory or leave a condolence message for the family.